More than forty years ago, the McGill Department of Family Medicine started out as a small teaching program with units based in Montreal-area hospitals. From its humble yet significant beginnings, the Department has since grown to become a leading voice and champion of primary care in Quebec, in Canada and around the world. True to its mission of excellence, this year the Department is celebrating yet another milestone in its success story: the official accreditation of its PhD program in Family Medicine and Primary Care. The Department recruited Dr. Bartlett, a trained epidemiologist, in 2005 to help increase research capacity, alongside Drs. Pierre Pluye and Charo Rodriguez. Starting out as an ad hoc program in 2014, the doctorate program in Family Medicine has proved to be truly unique due to its interdisciplinary approach to primary care. The program provides rigorous training in qualitative, quantitative, mixed methods, knowledge synthesis and participatory research approaches. 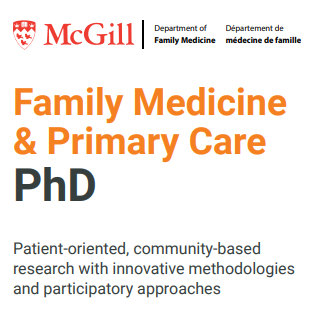 McGill’s Department of Family Medicine is home to a multifaceted and diverse community of health care professionals, researchers and support staff, sharing the collective mission to contribute to the health of populations and the sustainability of the healthcare system. All this makes it a great choice for trainees. Additionally, the Department encourages the participation of students coming from a wide variety of academic and work acquirements. “Coming into the Department with a background in social sciences, I have always felt like my previous experience and input were valued by my peers and mentors,” adds Justin Gagnon, another PhD student in Family Medicine. The future of primary care is increasingly bright – as the Department of Family Medicine advances crucial research in its pursuit of excellence in health care delivery, patient care and education.